Hoping to ‘Eclipse’ their rivals, this online casino is a relative newcomer to the industry and just one of many popping up that are licensed and operated in Curacao. Operating since 2017, Eclipse Casino has a somewhat mystical feeling about it and we couldn’t help but feel excited when we visited the site to start writing this review. UP TO $2500 BONUSNew Customer Offer. T&Cs Apply. 18+. Please Gamble Responsibly. Have a great time at Eclipse Casino! Find out where the fun starts by trying out their huge selection of games. When you arrive at the homepage, you’re greeted by a midnight blue colour scheme, in a sort of cosmic theme that has a certain allure to it. This theme continues as you navigate the site, via the subheadings set in circles that almost look like planets orbiting a large star in the centre. There are sharp blue highlights throughout which really bring the page to life and make this a brilliant site to look at, so we were really hoping it ticked all the other boxes, too. The mysterious theme continues in that there is not too much on display on the homepage – and you really have to delve deeper into the site to reveal all it has to offer. In this Eclipse Casino review, we’ll tell you all you need to know about how to make the most of our bonus codes and promo codes, as well as giving you a brief preview of their games. But let’s start with that all-important welcome offer. As you can tell by the number of similar reviews we write, the online casino market is one that is constantly being added to, meaning competition for customers is incredibly fierce. 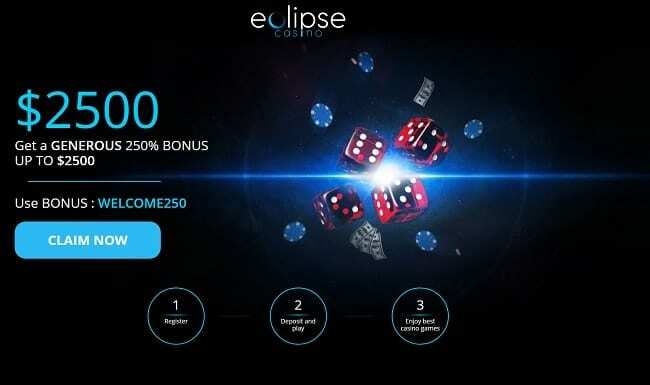 For this reason, many sites are now going all out with their offers and promotions in order to gobble up as much of the market share as possible – and this is evident with the Eclipse Casino bonus codes for new players in April 2019. Now, as we know, welcome offers can often change as sites are constantly trying to keep the pace with their competitors, but at the time of writing this review, the brand is offering a 20% welcome bonus up to $2500, when using the relevant bonus and promo codes. In addition to this, new customers can also qualify for a $3000 slots bonus and a $1500 cards bonus. On top of this, there are monthly rewards, which existing customers can also take advantage of. So, how do they work? Well, when you make a deposit simply enter the relevant bonus code and you’ll receive a percentage bonus on top of your real cash. The more you deposit, the bigger the bonus and the maximum you’ll be eligible for is a 215% bonus on a $150 deposit. Not too shabby. As with some of Eclipse Casino’s sister sites, there is also a very rewarding VIP scheme which is available to all customers. It follows the same format as most similar reward schemes in that the more you deposit and play, the more loyalty points you’ll receive and the faster you’ll climb the VIP ranks. As always, we suggest reading the full list of terms and conditions at the website. Like we always say, any online casino is only as good as its games and content, so how does the site stack up? Well, when clicking on the games tab, you’ll see there is a huge number of games available, almost too much to scroll through, which is why the filter options are a much-needed inclusion. Here you’ll be able to refine the games in order to find exactly what you’re looking for. The games fall under the following subheadings, All Games, New Games, I-Slots, Table Games, Video Poker online, Speciality Games, 3-Reel Slots and Video Slots. In terms of slots, there is a vast selection to choose from and titles include classics such as Chariots of Fire and Juicy Jewels, as well as some newer titles including Alien Spinvasion and Ice Picks. The table games on offer are steady, if not spectacular and include all the usual suspects such as Blackjack, Roulette, Craps games and multiple varieties of poker. All in all, the brand offers a pretty solid selection of games and features, but could definitely benefit from a few live games, to reach out to those who enjoy the thrill of playing with live dealers and croupiers. In terms of software, the brand works in collaboration with Rival Casinos to provide their content and cashier solutions. Rival have been making waves within the industry since 2006 and continue to stay ahead of the curve by offering the latest innovations and trends, such as I-Slots. One of the big benefits for casinos that use Rival Casinos to power the site is their brilliant cashier options. For example, Rival will not only allow you to reverse a withdrawal, but they will also count it as a new deposit, which in hand will allow you to redeem bonuses on it and gain VIP points, too. See our Golden Lion Casino review and Supernova Casino review for more sites from the same software type. This gets a major thumbs-up from us, as it is not something we come across every day and is a nice little selling point. Try out all the features with your Eclipse Casino login today. The only real sticking point is the minimum deposit amount, which sits at $25 across all payment methods. We prefer when online casinos offer a minimum deposit of $10, as it allows small stakers to get involved too. The minimum withdrawal amount is also a bit too high for us, currently set at $100. Again, this only serves to alienate the more casual online casino users and makes it seem like the site is only interested in targeting high rollers, so this is a little disappointing. If you are lucky enough to request a withdrawal, you could be waiting up to seven business days to receive your cash, but it is usually a lot quicker than that. It will come as no surprise to hear that the website is fully mobile compatible, as are most online casinos these days. What makes this one slightly different, however, is the fact that it can be downloaded straight to your device as a piece of software. However, if you’d rather not download, you can of course still access the mobile-friendly version of the site via your internet browser on your smartphone or tablet. Loads of mobile casino game apps are available online these days. We found that we didn’t quite get the same feeling initial mystical feeling with the Eclipse Casino mobile site that we did from the desktop version, but that being said, it’s still a very solid mobile platform that worked without any hiccups. Still unsure what to make of our Eclipse Casino review? Well, let’s sum it up for you. All in all, this is a great site that is working wonders, considering it was only launched back in 2017. You can see they are trying to make a statement with their welcome offer and ongoing promotions, but our only fear is that they’re exclusively targeting elite players, instead of focusing on customers of all budgets and experience. In terms of game and content, there is certainly enough here to keep you entertained for prolonged periods and the I-Slots are a real winner in our eyes. We were a little bit disappointed by the lack of live casino games, but maybe this is something that will come with time. Also, we’d be remiss not to again mention those somewhat unreasonable minimum deposit and withdrawal amounts – and without sounding like a broken record, we feel they are just that bit too high to attract the casual gamer. If you can get past this however, you’ll be treated to an online casino that gets pretty much everything else spot on. So don’t hesitate, make the most of our Eclipse Casino bonus codes today.